Canada has come together to support the victims of the Fort McMurray wildfires in a remarkable way, and we wanted to get involved to help the pets and families that have been affected. 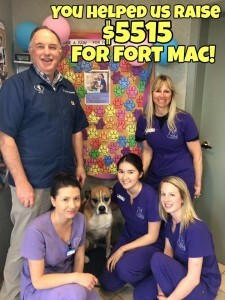 From May 16th 31st, all of our nail trims were by donation with 100% of the proceeds benefiting the Calgary Humane Society. We want to send a big THANK YOU every single pet owner and pet that came in to support our nail trim donation drive. Our donor’s contribution totaled $2757.50 and the hospital matched that total. That means we are donating $5515 to the Calgary Humane Society in support of Fort McMurray! We are lucky to be in such an amazing and generous community. So many pets and families affected by the wildfires will be helped because of this, and we can’t thank our donors enough!